The pitch which Wales are set to start their Euro 2016 qualifying campaign on faces a further inspection before the match on 9 September can take place. European football governing body Uefa announced on Thursday that more work needed to be done on the new 3G surface at the Andorra National Stadium. Tests showed the ball rolls too fast on the 3G artificial surface. A decision is expected by Wednesday 3 September, and if the pitch fails the inspection the game will be moved. 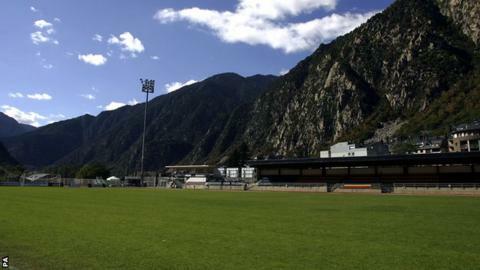 The new 3,300-capacity national stadium in the capital Andorra le Vella is the country's only venue capable of hosting the Euro qualifier against Chris Coleman's side. One option would be to move the game to neighbouring Spain, although Andorra admitted there is no alternative plan in place. A Uefa spokesman told BBC Wales that should the pitch be deemed unplayable then a new venue will have to be found - less than a week before kick-off. However, Andorra sporting co-ordinator Jordi Beal is confident that they can make the required alterations in time. "There was one test that didn't work very well, it's not a big deal but we have to do some work now and we expect to have the re-evaluation next Monday or Thursday," he said. The decision was taken to install an artificial pitch as it is used by both rugby and football teams. Laboratory and field tests have been carried out on the new surface to see whether it is fit to play on. The tests included durability, how the surface reacts to players' skin when sliding, how the ball rolls and bounces on the turf and how it absorbs the shock of a player hitting the floor when falling. Wales manager Chris Coleman said they would wait for Fifa's verdict: "Ideally we'd be on the grass as we're not used to playing on a 3G pitch. "I was speaking to Carlo [Real Madrid manager Ancelotti] and he said when Madrid played on 3G pitch against weaker opposition the players struggled because they didn't like the surface. "My message to our players is 'forget where we're playing'. We've got to get a result and whatever the surface we've got to get through it and do our job. "If Fifa say we're not going to play on that pitch and we're going to play on the grass, we'll play on the grass. "But if they say we've got to play on 3G, we'll play on 3G - and get a result. That's how it is."